The Dow hits its highest level since late 2007 in intraday action and closes with a gain of nearly 70 points. NEW YORK (TheStreet) -- Stocks kicked off May on a strong note Tuesday, posting smart gains after a much better-than-expected report on U.S. manufacturing activity. The Dow Jones Industrial Average rose 67 points, or 0.5%, to close at 13,280, after hitting an intra-day high of 13,338, levels not seen since late 2007. 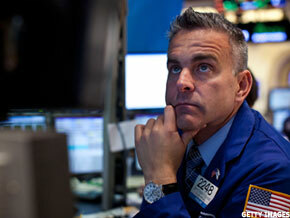 The S&P 500 gained 8 points, or 0.6%, to finish at 1406, and the Nasdaq added 4 points, or 0.1%, to close at 3050. Breadth within the Dow was positive, with 22 stocks ending in the positive territory. The biggest percentage gainers among the blue chips were JPMorgan ( JPM, Bank of America ( BAC, Alcoa ( AA, Intel ( INTC and Hewlett-Packard ( HPQ. Shares of Bank of America climbed 2.5% to qualify as the Dow's biggest gainer. The bank is planning to cut 2,000 jobs in its investment banking and wealth management businesses, the Wall Street Journal reported. Caterpillar ( CAT and Pfizer ( PFE were among the prominent losers on the Dow. Shares of Pfizer ( PFE slipped 0.6% after the drug giant reported first-quarter adjusted earnings of 58 cents a share on revenue of $15.4 billion; analysts were expecting earnings of 56 cents a share on revenue of $15.47 billion. In the broad market, winners outpaced losers by nearly a 2-to-1 ratio on the New York Stock Exchange but breadth was negative on the Nasdaq, with losers outpacing winners by a small margin. "The institutional players are very bullish about the market and retail investors are a little sheepish," says Kevin Mahn, chief investment officer of Hennion & Walsh Asset Management. "I think it comes down to data points. We'll see what the jobs report on Friday holds for us. One big surprise on either side could make the difference." Stocks finished modestly lower Monday, marking the first monthly decline for the S&P 500 and Nasdaq in 2012, as shaky U.S. economic data dominated the headlines. The mood changed though after the Institute for Supply Management reported that its index on U.S. manufacturing activity rose to 54.8 in April from 53.4 in March. It was the best read since last June. Economists surveyed by Thomson Reuters expected the index slipped to 53. A reading of more than 50 indicates growth in activity. "That the ISM was able to push higher by 1.4 points is incredibly encouraging especially in light of slowing PMIs in several other countries," says BTIG chief global strategist, Dan Greenhaus. Another bright spot in the global economic headlines Tuesday was China, which looks to be on track for a soft landing, after posting a modestly stronger read on its industrial sector. The country's official purchasing managers' index rose to 53.3 last month, its strongest in more than a year, from 53.1 in March. Also helping to lift investor mood was more Fed stimulus talk. Before a panel at the Milken Institute global conference in Los Angeles, Federal Reserve president Charles Evans of Chicago said on CNBC that growth has been disappointing to this point in the recovery and that there's a "tremendous amount of room for more accommodation to stimulate the economy." Fed president Dennis Lockhart of Atlanta, in the joint interview, was more reticent on this point, saying he wasn't sure if more stimulus would really have that big an impact toward improving the economy and risk appetite within the financial system. In other economic news, the U.S. Department of Commerce said March construction spending increased 0.1%, missing the 0.5% rise estimated by economists. The prior month's figure was downwardly revised to a decline of 1.4% from a fall of 1.1%. The highlight of the economic calendar this week remains Friday's April nonfarm payrolls report. The economy added only 120,000 jobs in March, about half the gains posted in the previous three months, disappointing investors who were hoping for continuing signs of a strengthening economy. Peter Cardillo, chief market economist at Rockwell Global Capital wouldn't be surprised if the strength seen in the markets on the first day of May persisted through the week. "On this first day of May, the market is reacting on the positive side," says Cardillo. "At the end of the week, we could see further evidence of the jobs market continuing to show improvement. I expect 169,000 new jobs being created. " "The monthly jobs report is an incredibly significant number driving consumer confidence," says Bill Hampel, chief economist at Credit Union National Association. "While unemployment is misbehaving, monthly job numbers will be number one that we pay attention to... most people are talking in the mid-100,000s. Growth of between 120,000 to 170,000 should be yawned at. Where you get a significant downtrend is if it's below 100,000 and we'd get a real lift if it's over 200,000. Consensus is somewhere around 150,000." It's been a light trading session Tuesday overseas, with most of the main Asian and European markets closed for the May Day holiday. London's FTSE closed up 1.3% and Japan's Nikkei Average finished down 1.8%. "There's no question that Europe remains the wild card and from time to time it will have negative impact on the market," adds Cardillo of Rockwell. In other corporate news, oil giant BP ( BP said first-quarter net profit fell 18%, hurt by weakness in its downstream business. BP posted net profit of $5.9 billion, down from $7.3 billion a year earlier. Replacement cost profit declined 12% to $4.9 billion. Underlying replacement cost profit at BP's downstream business fell 58%. Shares closed lower by 1.6%. Chesapeake Energy ( CHK shares popped 6.3% after its CEO Aubrey McClendon agreed to give up his chairman role and an early end to a program that allowed him to have interests in thousands of oil and gas wells. The move comes amid investor outcry in reaction to news reports on McClendon's borrowing of as much as $1.4 billion in personal loans against his stakes in the well participation program. The company reported a loss for the first quarter after the close. Satellite radio company Sirius XM ( SIRI beat Wall Street's revenue estimate in the first quarter, boosted by strong subscriber growth. The satellite radio giant brought in revenue of $805 million, up from $724 million in the prior year's quarter, and above analysts' estimates of $803.83. Shares closed lower by 1.1%. GM ( GM shares added 1.3% after the automaker increased its full-year light vehicle sales forecast to between 14 million and 14.5 million units, up from 13.5 million to 14 million units. Shares of Chinese food chain P.F. Chang's China Bistro ( PFCB jumped nearly 30% after it agreed to be acquired by a private equity firm for a 30% premium. The restaurant said first quarter profit fell more than 40%. In commodity markets, the June crude oil contract rose $1.13 at $106 a barrel. June gold futures dipped $1.80 to settle at $1,662.40 an ounce. The benchmark 10-year Treasury was down 8/32, lifting the yield to 1.948%. The dollar traded sideways.